In essence this law applies to hedges of consisting of two or more evergreens, or mostly evergreen trees, (not to individual trees) and hedges over two metres affecting domestic property. This means is that if you pick a shrub which is very fast growing you will need to be scrupulous with maintenance and pruning so as not to offend neighbours and the law. If in doubt, you should take legal advice from an appropriate source such as Citizens Advice or a solicitor. If you are planning a hedge or screen in proximity to your neighbours, you need to be aware of the law and act sensitively. As an alternative you could consider planting a deciduous hedge, such as a Fagus, the common Beech which is fast growing and not evergreen. It give privacy but a less dense shrub creating less shade. Planting a fast growing shrub is good in some ways as it produces a more instant result, but a fast growing hedge produces a lot of growth quickly and needs regular pruning. It can also produce very dense shade around it. It is important to view the space and surroundings before making a decision. For example, Portuguese laurel is correctly billed as a fast growing evergreen, but it also gets very large quickly and in around 7 years can reach 7m and 2/3m wide which if planted on a boundary could swamp the area and be unmanageable. It is a question of balance, to cover or clothe a fence or unattractive spot in the garden weighed against the size the evergreen will become and how quickly. It is great to get the cover, but you do not want to have to spend time, or money cutting back to prevent the evergreen taking over. With that caveat there are a good number of easy, fast growing evergreen shrubs. Photinia is fast growing and a popular variety is P. 'Red Robin' It will grow up to 5m in height and spread, and can be contained by regular pruning. Should the shrub become overgrown it will respond to hard pruning. The new growth is an attractive bright red in the spring. Photinia Easy to grow, not fussy about soil types and Hardy H5/H4. Escallonia is fast growing and makes a great hedge. Evergreen waxy leaves with lovely pink or white flowers. Unfortunately, it is not fully hardy everywhere in the UK, this hedge was growing in Guernsey, but it will grow in many parts of the UK with some shelter. For growing tips and advice on the hardiest varieties to grow. Choiysa is another fast growing shrub although not as large as some others. The most popular varieties C. 'Aztec Pearl' and 'ternata' both reach around 2.5m. The up side is that Choiysa is a very attractive shrub, with glossy leaves and highly scented flowers- and easy to grow; tips on growing. Pyracantha ' Orange Glow' has orange there are also varieties with bright red berries. Pyracantha are fast growing and tolerant of most growing conditions. Pyracanthas will reach a height of between 3-4m and tolerate partial shade. Prunus lusitanica, the Portuguese laurel has attractive leaves, dark green with small white flowers in the spring. It's main merit is that it grows fast and furious to a height of 12m and above. It has dense growth so will create a complete barrier but also a lot of shade and care has to be taken when planting to ensure it doesn't overshadow where it is not wanted. More attractive then the image suggests it also has white flowers in the spring. If you are fortunate to have the right growing conditions, Clematis Armandii is a fast growing evergreen Clematis which will grow to around 8 meters in around 5-10 years depending on the conditions. To look good and retain its leaves and evergreen status, C. Armandii requires a warm sheltered spot but rewards with lovely glossy leaves and scented flowers. Lots of information on planting and growing Clematis. The Clematis show is armandii ' Apple blossom' more information on types of Clematis. It's not evergreen, but well worth considering Fagus sylvatica the Common Beech. It makes a beautiful hedge with so much interest. 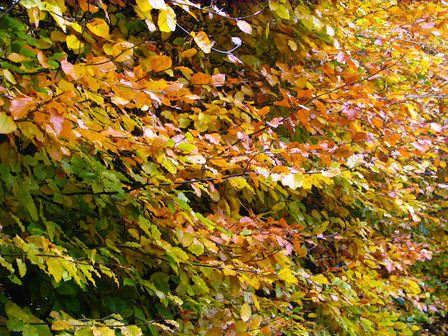 Illustrated here is the Autumn colour followed by brown leaves which stay most of the winter. The new growth in spring is vivid green. It is not fussy about growing conditions, and will reach an ultimate height of around 15m. Birds love to nest in it. For this reason it is generally pruned in August, as it is an offence under the Wildlife & Countryside Act 1981 to damage or destroy the nest of any wild bird while it is in use or being built. It makes a really stylish hedge.